Lyme disease affects dogs, cats, people, horses, birds, cattle, and wild animals. Although it affects a large group of animals, clinical signs are often observed only in dogs and humans. In dogs, the most pronounced symptoms of Lyme disease are sore joints, a stiff gait, and lameness. The lameness is not always pronounced and often shifts from one leg to the other. 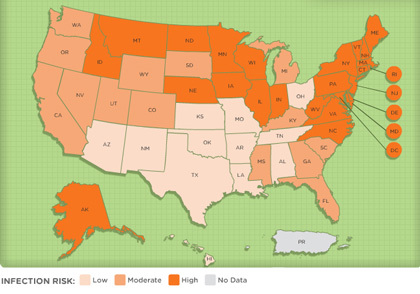 Although Lyme disease has been diagnosed in people in all 50 states, more than 80% of human cases have occurred in the eastern states from Massachusetts to Virginia. The disease was named after Lyme, Connecticut, where the first human cases occurred in 1975. Lyme disease is caused by a bacteria-like organism called Borrelia burgdorferi. This organism is transmitted to animals by the deer tick, Ixodes dammini. Borrelia burgdorferi is difficult to isolate from clinically affected animals, however it can be isolated from these ticks. The white-tailed deer and white-footed mouse are involved in transmission of the disease. The adult tick attaches to the deer and feeds on its blood. These adult ticks drop off the deer and lay eggs. The eggs hatch, larva and nymphs (young ticks) emerge, and these young ticks attach to mice. Since the white-footed mouse is the main reservoir of the disease, the young ticks become infected with the Borrelia organism. Both the young ticks (nymph) and the adult ticks are responsible for transmitting the disease to animals. Researchers believe that the tick must attach to the animal for a period of 10-24 hours before the Borrelia organism becomes infectious. This is an important fact when dealing with prevention of the disease. Arthritis, with joint pain, is the most common clinical symptom in dogs. Other symptoms include weight loss, fever, fatigue and swollen lymph glands. A complete veterinary examination along with blood tests is required for diagnosing Lyme disease. Ticks are generally found in wooded areas. They are most active during the warm months. 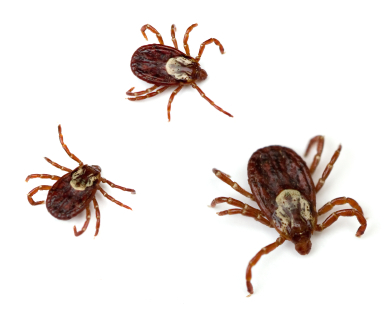 Pets should be examined daily for ticks. If ticks are found, they should be removed immediately. Unfortunately the ticks that carry Lyme disease are extremely small. The nymph stage of the deer tick is equivalent to the size of a pinhead. Very often, single nymphs or adult ticks are not seen. (Remember that the tick must attach for a period of 10-24 hours before the Borrelia organism can be transmitted). Spraying your dog with a tick repellent is beneficial; however, your veterinarian can recommend a product that is more effective, more convenient and lasts longer than a conventional spray. A vaccine for the prevention of Lyme disease exists for dogs. Ask your veterinarian about vaccinating against Lyme disease.